I'm now starting week 5 of training for Palo Duro 50K. To get through the first few very hot weeks of training I had to rely on doing all of my runs early. Really really early! As in 4:45 am early. And surprisingly, I enjoyed them! Could be that a leopard can change it's spots, since not only do I not enjoy hot temps but I've never been a morning runner either. And now I am! It's quiet, the stars are bright and beautiful and I get to spend a little quality time with Ladybird. It's really been the only time I can possibly run. By 9:00 am it's over 90 degrees outside and it wasn't dropping below 100 degrees until after 10:00 pm. Crazy! So ya do what ya gotta do. Thankfully, I am feeling good and running strong. (!) Running about 30-34 miles a week and although I can still feel the ever present ITB tightness and hip bursitis, it seems to be gradually diminishing. I'm seeing a chiropractor regularly as well as keeping on top of my nutrition, stretching and hip strengthening exercises. Since I am feeling good I am considering bumping up from the 25K next month at Do-Wacka-Do to the 50K and using the race as a training run for Palo Duro 50K in October. I need a 22 mile training run that day and my reasoning is that I could run the 22 miles and then run/walk the remaining 9-10 miles and take it easy. Thoughts anyone? 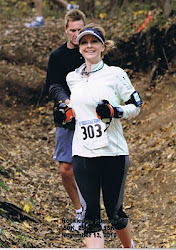 I'm getting so excited for fall races and cooler weather that I can hardly stand it...fall fever is a real thing! And I have it!